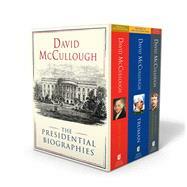 From “one of our most gifted living writers” (The Washington Post), this collection includes David McCullough’s masterful biographies of three great presidents: John Adams, Harry S. Truman, and Theodore Roosevelt. Both John Adams and Truman won the Pulitzer Prize for biography. The Pulitzer Prize–winning, bestselling biography of America’s founding father and second president that was the basis for the acclaimed HBO series, John Adams reads like an epic historical novel, breathing fresh life into the history of the American Revolution and the birth of the young republic. The Pulitzer Prize–winning biography of Harry S. Truman, whose presidency included momentous events from the atomic bombing of Japan to the outbreak of the Cold War and the Korean War. The National Book Award–winning biography that tells the story of how young Teddy Roosevelt transformed himself from a sickly boy into the vigorous man who would become a war hero and ultimately president of the United States.